on December 10, 2014 Get your tickets now! When a little boy’s gender atypical gift request to the North Pole is denied, a series of heart-felt letters from the child nudge Santa Claus out of the closet, and into the culture wars. The play’s Off Broadway run was heralded as “Hilarious” and “Brilliant” by Broadway World and Out Magazine. The New York Times raved: “A Delightful Surprise! … This isn’t a clumsy parody, but a sensitive, imaginative tale that really is about a boy’s realization that he is different. Mr. Solomon portrays an amazing range of characters, all of them beautifully.” A theatrical documentarian in the mold of Anna Deveare Smith and the Laramie Project, Mr. Solomon purports to have interviewed, and portrays, all of the key players in the scandal that has come to be known as ‘Santa-Gate’. 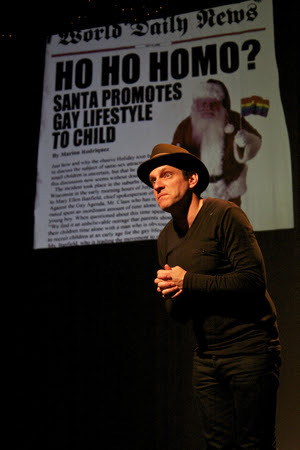 The play was inspired by the national movement to speak honestly and openly to children about LGBT lives and issues, and the conservative backlash. Jeffrey Solomon’s other solo play “MotherSON” has been sponsored by PFLAG NYC and is a favorite of PFLAG chapters all over the U.S.
Can’t make the TWO Benefit? There is another performance on 11/25.